Eduard from the Czech Republic released a famous fighter from the German Luftwaffe in 1/48th this month that Wasn't the Bf-109E! Czech out the last in the line of the Fw-190 variants in this the a-7 version of this famous fighter. Available from: Eduard Direct and Eduard Stockists. 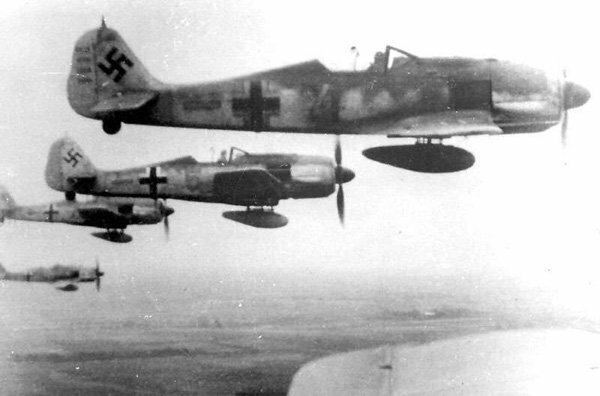 The Fw-190a-7 was introduced as an upgrade to the A-6 variant in Luftwaffe service, overshadowed by the A-8 in production numbers it was otherwise just as important as its numerically superior sibling. 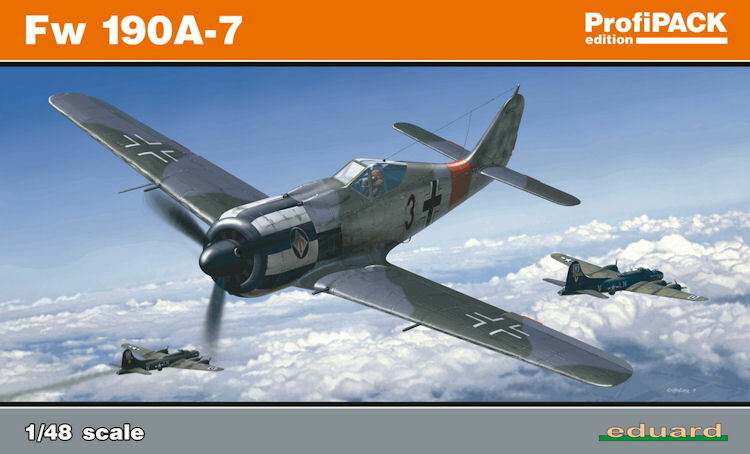 Like the real life aircraft the release of this kit is just as anticipated as the other more numerous brothers in this production series - this Fw-190a-7 kit in the ProfiPACK edition is the last in the Wurger family (not counting the A-9) to be presented in 1/48th scale by Eduard. They have included the necessary additions to make the A-7 kit which we will look at today – I am not wasting your time with history of the aircraft – Let's go straight into the kit shall we? The lovely looking box art on this kit has adorned my desktop for a week now so I was pleased to receive it in the post this week. The box art actually rivals the A-8 boxing of the butcher bird from Eduard that was my favourite until now – well done on making the kit look aspirational with great artwork. The plastic on offer is dark tan with just a little bit of flash on the extremities of the wheels which is an easy to remove problem. The sprues themselves come in packages of two to avoid any scratching or scuffing of the surface area of the kit. Unfortunately I had a few scratches on the fuselage, nothing too bad that will not come out with some very smooth sandpaper to polish the surface. Many many tiny laser cut rivets decorate the fuselage, whose panel lies are sharp and to scale, no trenches here – the panels on the engine cowlings are very impressive especially, and as there may very well be on show when this model is finished I am happy to say I like the surface finish very much indeed. The Instructions a clear and start with a sprue breakout sheet showing you what the sprue is long after you cut the letters off, colour call out which is translated from RLM colours into Aqueous, Mr color, and Mr Metal shades. The instructions themselves are clear and easy to follow. They show you where to add the glue, where to insert the extras and at certain parts to interrupt or make way for an option which comes later on in the kit. 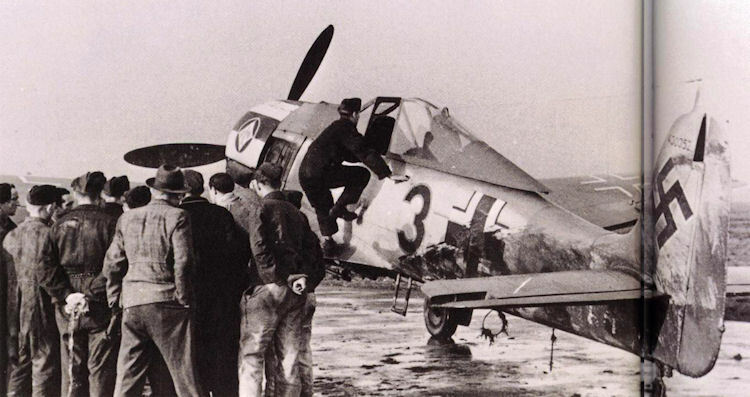 Over time manufacturers have learnt how to best model lots of kits and the Fw-190 especially is a different kit to model the first time you come across it. The inclusion of the undercarriage which is open to the underside of the engine, the cowling which always bolts on later in one piece and the bottom part of the wings which glue on to the top of the fuselage is unorthodox but by far the best way to fix the Wurger together and Eduard follows that path here. Those familiar with Tamiya and especially Hasegawa kits will find these easy going and a little bit more detailed ( if not a little bit more fiddly) These Eduard Fw-190 kits are for a good reason leading the way in the great compromise between detail and buildabillity in 1/48th. Construction starts with the cockpit which is full of Photoetch pre painted parts which are so helpful to modellers and save a great deal of time if you do use them. The cockpit has the old fashioned side panels and instrument panel for you as well if you want to go old school on it, but I would say embrace this technology – you aren’t cheating – the results speak for themselves, especially in 48th scale where the details look sharp. It takes a good modeller and a fair bit of time to replicate the excellent panels offered here. The only problem you have is matching the pre painted cockpit colour. If you don’t want to go with the P/E there are decals for all of the cockpit parts, panels and gauges, the result will still be great. The rest of the cockpit must match the PE so I can see some people skipping it. The harness and the side wall placards and several additions like the manual canopy winding control and the “Danger” panel on the back of the seat are signatures of the fw190 that cannot be overlooked and are looking quite realistic in their representation here. Next in the instructions come the gun bay in which are included some nicely detailed internal walls with some equally impressive MG131s above ammunition troughs. The only thing these MG’s could use are slightly hollowed out ends but a bit of careful work will see yours looking open ended in no time. This is one area I know quite a few modellers will actually care to add some extra goodies in the shape of brass barrels. The kit supplied guns though look quite reasonable to me, and if you are going to close the gun-bay I would stick with them. The two part tail wheel strut encapsulates the simple but well detailed tail wheel at the back of the aircraft before this, the cockpit and gun bay are all applied to the kit before it is all sealed up. This section sits on top of the bottom half of the wing section. Before the wing is joined together there are several spar, stringer parts and undercarriage details that are added to the under-wing section. This is made into a complete bay before the top parts of the wings can go together and the fuselage can be added. 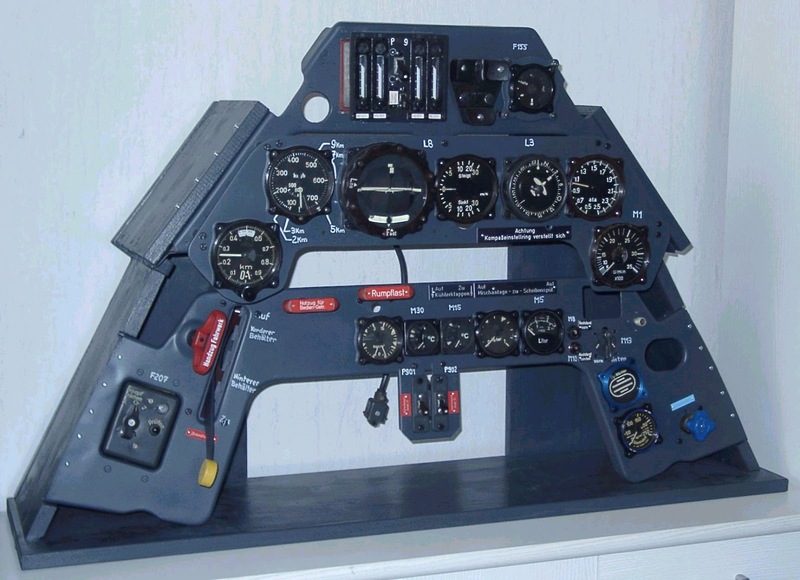 This is a familiar set up to most Fw190 builders. The detail however offered by Eduard is a little better than most kits. Not at all “soft” in realism this undercarriage will be a joy to behold once assembled, painted and weathered. The upper covers of the wheel bays are added (and as you can see here have some nice details) are added before you can secure the two halves of the wing. While on the undercarriage bay area I will say that the main gear is well replicated with long struts with separate scissor oleos the instructions clearly show the angle in the instructions that the main wheels are poised at, this is a feature of this fighter that is easy to get wrong for the novice Wurger builder. The tyres, like the tail wheel are not weighted in appearance but however do come very detailed and with the option of treaded or smooth tyres. The only thing you are missing here is some lead wire for lines down the wheels. With the aircraft ¾ completed the instructions tell you to add the upper two parts of the instrument panel at this point. This can be done later on in the build before the gun bay cover is added because next is the engine construction and I would leave it to the last moment, especially the addition of the Revi gunsight which always seem to be the first thing to be damaged in a fighter when applied to early, The gunsight itself is very nice and includes a clear part to make the gunsight complete. 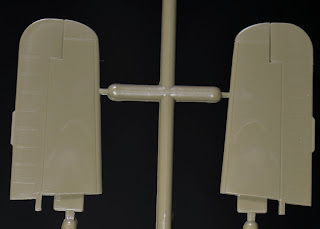 The ailerons are supplied as positionable surfaces here and they are well detailed but not overdone. The control surfaces are mostly positionable, and pretty well detailed. There isn’t any heavy handed over doing it here with just right ribbing on the Ailerons and the tail surfaces Some positionable flaps would be the icing on the cake but not available in this release. There is however a positionable vertical real stabilizer and the horizontals can be easily sliced off neatly to be posed with not too much effort. The air cooled rotary BMW 801 fourteen cylinder engine is a large part of the kit and for some reason does not have the option to be shown here all open like the gun bay. The firewall, exhausts, pushrods and cylinders with their magnetos at the front of the engine cannot be seen behind the propeller and cooling fan. I am sure the more adventurous modellers will fabricate their own internal addition to the cowling to make them exposed. This is the one part of the kit I would include the option for, and a shame that it isn’t included in this otherwise excellent kit. The engine itself is complex but not complicated. Eduard help you out by providing a template for the exhaust positions at the rear of the engine block. The framing o fthe engine is excellent as well and thinly moulded. This is really the most intricate and time consuming part of the kit, the only shame is that you will not see much of your efforts after it is all closed up. As I mentioned already the cowling all joins together into one large piece before it secures on to the engine and bottom of the aircraft. To be honest this isn’t done really well by any company and can be a fiddly process on every Wurger kit I have made. You must dry fir everything and just make sure it all goes together without problems and either join it all piece by piece or all in one then secure it to the rest of the kit. I prefer the second method as it keeps the cowl universally angled and in a good circular shape. I am sure others will go the alternate first way I mentioned – their choice. The engine and the cowling remain the trickiest part of the kit ( and ANY Fw-190 kit – this is no worse than others – at least the surface detail is good here) but also the rewarding felling of finishing these tricky parts is one to be savoured. Ordnance options include a 300 litre drop tank, a bomb and two W.Gr.21 mortar. Although it is nice to have these they were rarely used in combat (maybe with exception of the tank) and they are marked not for use here – more spares! The only thing special to the A-7 and maybe (one can hope but it probably will not come) covered in a future release would be the streamlined experimental Doppelreiter 270 litre droptank! 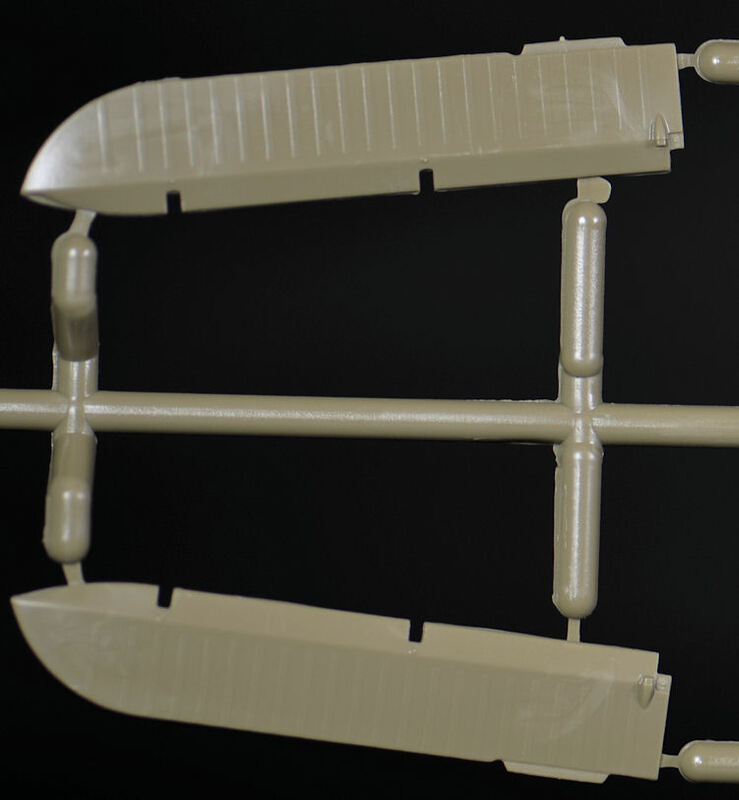 Eduard offer more spares for the box in the open or closed canopies – only one of the two are used and so you have the slightly narrower closed canopy and the more open (as it slides back into the open position) I like I that even these canopies in a smaller scale have both options. The armoured side windows are included for one variant “White 20” of Sturmstaffel I are included – this aircraft was a heavily armoured for-runner of the more famous A-8/R2 Sturmjäger or Rammjäger variants – this armoured transparency can be secured by using some thin glue (very) sparingly and running down the bottom seam in a capillary action. If you are nervous of this method (quite rightly so) then use clear or wood glue. Deluxe Materials make some great canopy glue for just this purpose. The photo etch in this kit comes in two types – pre-painted and regular uncoloured. First the coloured sheet which encompasses a finished accurate representation of all of the cockpit’s surrounds, Split instrument panels, side consoles, dials, warning signs and very helpfully seat harnesses. All pre painted and ready to be glued or bent into position. You can see from the real cockpit reconstruction picture these are accurate and make a kit in 1/48th look very sharp. I have used the Eduard 1/32 sheet on my large scale Wurger and they went on easily and gave my kit a more professional look. After I got over the feeling I was cheating I am a solid advocate of these coloured sets and love it that they are included here. 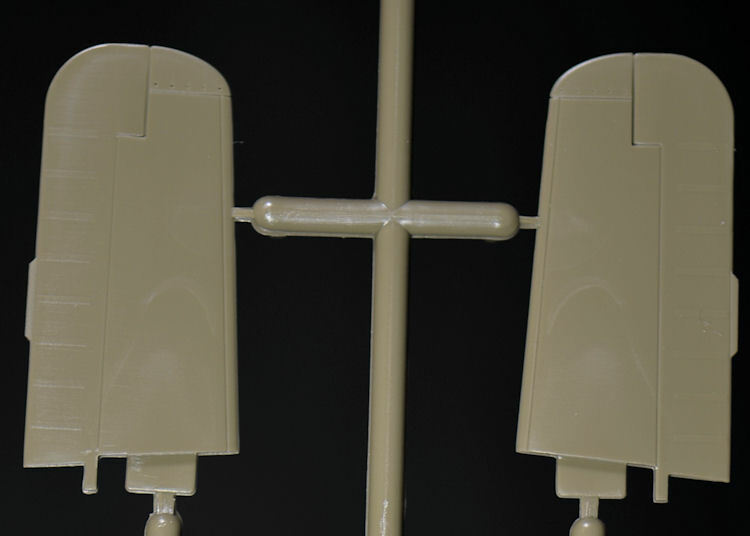 The regular P/E sheet contains tiny handles, buckles, manual canopy release, and delicate rudder pedals which look thin and to scale in 1/48th. This sheet however is dominated by the "Sturmjägerausrüstung" additional armour, which is 5mm thick on the original aircraft. It has a thin profile and all of the rivets in the right spots the appliqué armour had. 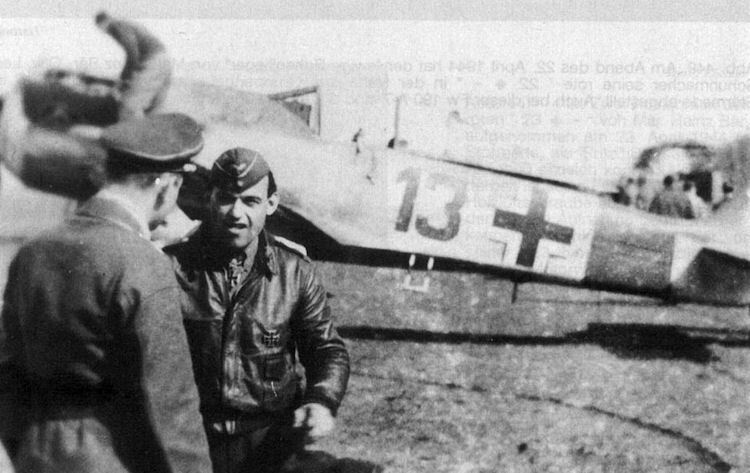 Swastikas are included in both split and whole versions as are full national markings for one aircraft. Afore-mentioned instrument panel in two parts is included as are tactical bands and personal and grouppe emblems. The colours are strong, the decals are within their lines in register and the whites look non transparent. Printed in the Czech Republic they are thin and carry limited carrier film – just like I like them! Here it is held against the light to show you. There are four different options of markings in this box – some of the most famous pilots from the Luftwaffe are included in the “kites” that all have the same standard RLM75/76 upper surfaces and RLM76 on the underside camouflage. 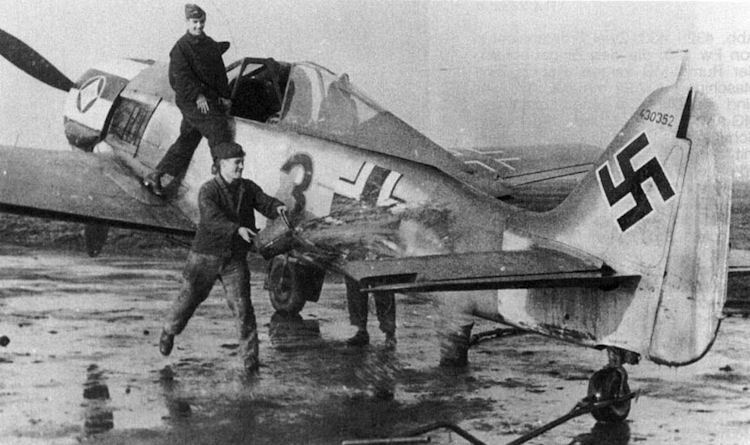 We will show you the profiles provided and at least one picture of the real plane in action during the war. I can say the only thing I would change if I were Eduard was to make the option of an open cowling. The rest of the kit would only complement the detail that has gone into the powerplant so it is a mystery that this is not a centrepiece of the kit like it should be. This is THE kit for the 48th scale Fw190A builder and now Eduard has released the machine that fills the gap in the production series let’s hope they turn their attention to the larger scale aircraft – this kit is a lot better in detail than the Hasegawa kit in 1/32 – let’s hope now we are finished the series we can see some “lateral movement” into the larger scale and up the ante when it comes to detail at an affordable price! A great kit with lovely detail, colour choices and options that will build in to great kit – well done Eduard!